Our services will start on arrival in Srinagar airport. You will be met by our representative & transfer to Baltal which is the most beautiful drive from Srinagar. On arrival at Baltal check into Tent/huts. Rest of the day free to relax. Overnight stay at Baltal. Early morning begin your Amarnath Yatra by helicopter from the Baltal huts which are just 10 minutes walk away from the Helipad. The helicopter operates between 6:00 a.m. And 1:00 p.m. Helicopter operates till Panchtarni then 6 kms. 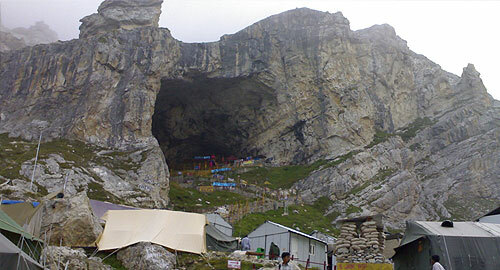 Trek from Panchtarni to Amarnath cave. You can also take Palki or Pony. After darshan return back to Baltal & you will be met by our driver. Transfer by vehicle from baltal to Srinagar. It takes approx three hours to reach Srinagar. On arrival at Srinagar check into Houseboat. After relaxation enjoy the sightseeing tour that includes visit to Mughal gardens. Overnight stay at Srinagar Houseboat/Hotel. » 01 Night stay in Baltal Tent or Huts on room only basis. » 01 Night stay in Houseboat/Hotel in Srinagar with breakfast. » Both way Helicopter Tickets. » Half day sightseeing of Srinagar. » All transportation by Non A/c Sumo. » Service tax 2.58% extra. Carry adequate warm Clothing Including Jacket, Sweater, Woolen Socks, hunter shoes, and Thermal underwear’s, Medicines Raincoat & Torch. Note : Helicopter fares are subject to change/any change in the package subject to natural calamity or any subject to enforce is to be paid by the traveling passenger at the time of travel enroute. » Due to bad weather Helicopter flight is cancelled, next day’s accommodation has to be taken care by the guest directly. Assistance can be given by our staff at Sonmarg & Transportation would be charged Rs.2000 extra per day by our staff at Sonmarg. » The schedule flight is cancelled due to bad weather or technical reason, advance booked passenger would get the priority next day. » A Helicopter ticket has to be stamped & signed by the officials of Himalayan/Pawan Hans at Baltal or Pahalgam for full refund.